Provide comfort for the family of Victor "Cameron" Dallyn with a meaningful gesture of sympathy. Victor “Cameron” Dallyn was born on Monday, February 27, 1928 in Ribstone, Alberta and passed away peacefully with family by his side on Monday, February 25, 2019 at the Provost Health Care Centre, Provost, Alberta. Cameron was the fourth child of six born to Victor and Virginia (Maib) in Ribstone, Alberta. Cameron attended school in Ribstone and then completed high school in Wainwright, Alberta. Cameron (Dad) then moved to Edmonton to work and this is where he met Laura(Mom). On April 14, 1952 Cameron married the love of his life-Laura (Letourneau). Together they moved back to Ribstone and worked in the store for his parents. They lived in the back of the store for 6 years and had 2 children-Brad and Brenda. Cameron bought a school bus in 1953 and continued to drive the bus for 54 years. In 1958 they bought a farm north of town and another son Greg was born. In 1960 they sold this farm and in September of 1960 they moved to the family farm owned by his parents-Victor and Virgie. In 1968 another daughter was born (Charleene), but unfortunately, she passed away shortly after birth. In July 1979 Cameron and Laura moved to Chauvin and Brad, Linda and family moved to the family farm where they still live today. Cameron continued to help on the farm and drive school bus until he retired at the age of 75. Dad was very involved in the farm and would help Brad and Linda in any way he could. In September of 2009, Laura passed away. Cameron continued to live in Chauvin until last March, when at the age of 90, he decided to move to the Hillcrest Lodge in Provost where he lived until passing away. Cameron will be forever remembered and lovingly missed by his children, Bradley (Linda) Dallyn and their family, Corey (Joline) - Brandon, Logan, Sloane; Ryan (Shelley) - Olivia, Owen, Kendyl; Chris (Lacie) - Berkley, Drew; Brenda(Donald) McMann and their family, Donna †; Lynette(Justin) - Layne(Courtney), Lynnaya (Matthew), Anna; Lori(Kevin)- Dyson, Kendra, Nolan, Mason, Carson; Lisa(Gary) - Cole, Ashley, Myles; Dustin (Ashley) - Keysha, Zack, Zayne, Kooper; Andrew (Joan) – Bella, Nicolas, Connor; Gregory (Tammy) and their family, Kayla (Colin) –Parker; Shannon (Shane); Landan(Sarah). Cameron will also be remembered by his sister-in-law Shirley; brother-in law Julian; as well as numerous nieces, nephews, other relatives and friends. Cameron was predeceased by his wife Laura; infant daughter, Charleene; infant granddaughter, Donna, parents, Victor and Virginia; siblings Orville, Laura Belle, Lucille, Lawrence and Duane; sisters- in- law, Marion and Pat; brother- in law Russell. To plant a memorial tree in honor of Victor "Cameron" Dallyn, please visit our Heartfelt Sympathies Store. We encourage you to share your most beloved memories of Victor "Cameron" here, so that the family and other loved ones can always see it. You can upload cherished photographs, or share your favorite stories, and can even comment on those shared by others. Plant a Tree in Memory of Victor "Cameron"
Bill and Jo-Anne (nee Worrall) Zawadiuk Our heartfelt condolences reach out to Family on Camerons' passing? 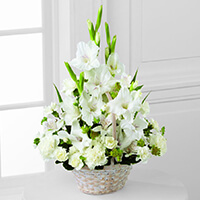 Terry Black purchased the The FTD Eternal Affection Arrangement for the family of Victor "Cameron" Dallyn. Brad and Lynda - we are so sorry to hear of Brad's Dad passing away. Sending you our love and prayers.